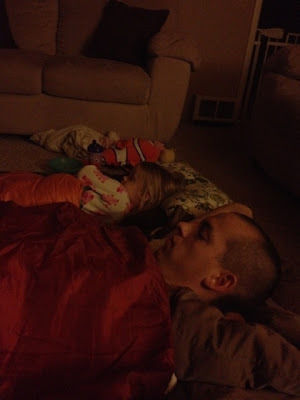 When Brian was little it was a tradition for his family to have campouts on the living room floor, he has such great memories of that! My mom got the girls sleeping bags for Christmas and ever since he has been really excited to have a sleepover in the living room with the girls! 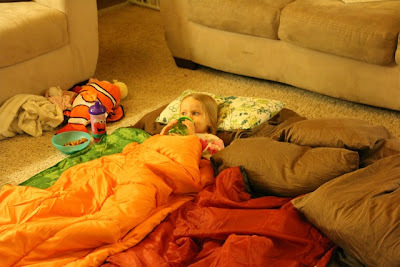 Last Friday after Claire went to bed we laid out our sleeping bags and watched Peter Pan 2 and ate snacks! Kenley LOVED it! We just bought Cinderella on DVD so we are saving it for our next living room campout! Cute! I have a picture somewhere of Samson sprawled out - pinning me between him and the couch and both of us sound asleep. Awesome.